Personally, I think good animation and design matters most (and ofc story, but that has nothing to do with animation), regardless of medium, be it 2D animation, Hand Drawn animation, 3D animation or Stop-Motion. Or if tools like Rotoscoping, Mo-Cap or Match Moving is being used. It all need to carry the same principals of animation and movie making techniques. People are too often giving lazy 2D a free pass simply because it's 2D, while 3D animation as a whole is often judged by lazy 3D animations. And both lazy 2D and lazy 3D is done by the same kind of unprofessional people that don't have an understanding of animation and its stages. I could care less if it's CGI or even traditionally animated. As long as they stay true to the tone of the series, I'll be fine with it. I'm sick of seeing it so much. I hate that there are no traditionally animated theatrical releases any more. I hate that nobody seems to care about it any more. I've always vastly preferred it, and while I don't mind CGI for some things, so many cartoons are using it when traditional animation would look so much better. For things like Toy Story and Transformers, CGI works in their favour. For things like Frozen that heavily feature human characters, it's an awful choice, because I don't like the way humans are often stylized in CGI. I think they look ugly. A good example is the boy from Up. I really don't like the way he looks. That movie, as much as I love it, would have been infinitely better-looking if it had been traditionally animated. I can't see DuckTales looking good in CGI, either. Also, one must remember that the CGI used in cartoons is generally much lower budget than the stuff you see in movies, and even if season 1 looks good, there's no telling what future seasons may look like if budgets get cut. A slight difference would be seriously noticeable with CGI, whereas with traditional animation it wouldn't be so severe. June Foray is 97 actually, meaning she'll be pushing 99 when the series airs. Alan Young will also be pushing 97 by then. Alan Young just voiced Scrooge this year in “Goofy’s First Love”. I don’t think he’s leaving the character anytime soon, nor should he. Didn't he also reprise his role in DuckTales Remastered? I have a friend on Facebook with whom I attended grade school. She was a fan of the show back in the day. I saw that her sister posted on her wall about the upcoming version. Since she's also going to have a baby soon, she told me in a message that she's looking forward to watching shows like this with her kid. So I hope her future daughter likes it. In fact, I'm hoping my friend likes it too. It's definitely do to with the art style. That and because hand-drawn animation has more charm and soul to it, not to mention more effort put into it. CGI to many feels like a cheaper and faster way of creating something. Hopefully a CGI DuckTales will look great though and I'm sure it will. Yeah, this is how I feel about CGI. I mostly prefer traditional animation. Feels more went into it, imo. I also have a higher appreciation for it. Not sure about the reliability but according to this report the new series will be CG animation. Also says Disney is considering bringing back Darkwing Duck as well. Yes please. I am the terror that flaps in the night! I am the mustard that squirts all over your new suit! I am Darkwiiiing Duck! There was supposed to be a continuation of Boom Studio’s Darkwing Duck comic this year, but it’s been put on hold due to the Ducktales reboot. …and that’s not even getting into the nitpicky things, like will Jim Cummings return to voice DW? He’s still got it, but so does the old Ducktales cast. Don't get your hopes up, folks. I've heard that this "Jim Hill" who is reporting this article isn't exactly a reliable source for news. I thought Boom Studios lost the license for Darkwing Duck and other Disney properties. Is this with another comic label? Yep, it took us longer than we hoped, but we did it... all new Darkwing Duck comics in 2015! There's also going to be some other Disney Afternoon favorites returning, some of which haven't had new stories in YEARS... but that's all I can say about that for the time being. As for the omnibus, I can honestly say that even if you own every DW comic that BOOM! published... the collection is worth getting. Not only did James do a ton of model fixes, but colors have been tweaked by Andrew Dalhouse and Lisa Moore. There's at least one new two-page spread in the FOWL arc, a new page added to a sequence in Campaign Carnage to tie the story together a little better... and the entire script of all 16 issues have been completely remastered by me and re-lettered by Deron Bennett. And, of course, it includes an all-new epilogue which wraps the whole thing up and launches us into the new status quo for the regular monthly series. Everyone who worked on the original series did a great job, and we're happy to be able to revisit it and bring you this "Definitively Dangerous Edition"! As for the monthly series, let's just say we start off with a bang! Where THE DUCK KNIGHT RETURNS was a slow build, the new series drops you right into the middle of Darkwing's world without a parachute! I think you're all going to love what we have in store! However the final storyline “Dangerous Currency” isn't included for multiple reasons, one of which is because it has been deemed non-canon by Disney. Which is good, also for multiple reasons. So the Joe Books Darkwing Duck comics will continue where #16 left off…hopefully after the Ducktales reboot airs. Very interesting. That's a pretty long wait. 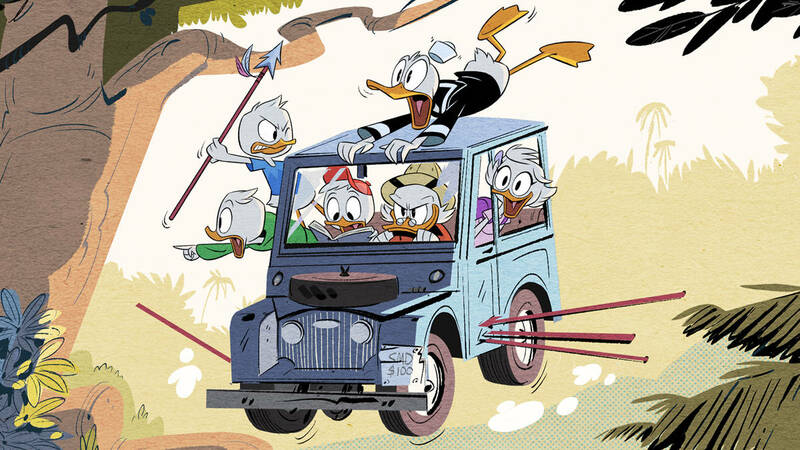 I wonder why the new Ducktales show postponed the new DWD comic series. Seems like they would be completely unrelated. It makes me think Darkwing could possibly make an appearance in the new Ducktales show. I glad this isn't stupid freakin flash animation yuck. kind of reminds me of Kim Possible's background design. No launchpad! inspiration by Carl Barks, so has potential. I really like the old Barks/Don Rosa comics.